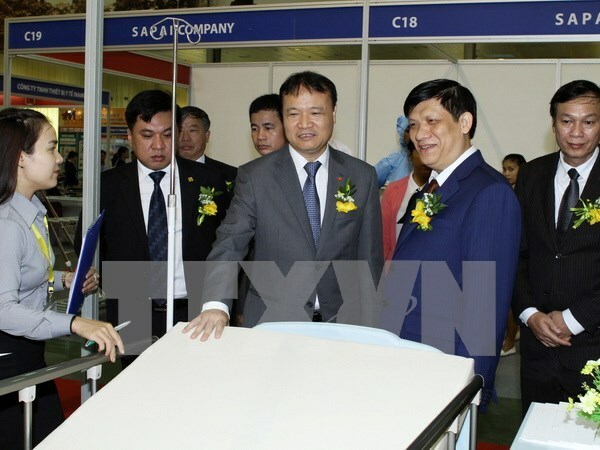 Hanoi (VNA) - The 22nd Vietnam International Medical and Pharmaceutical Exhibition which opened in Hanoi on December 2 gave attention to medical service packages alongside advanced pharmaceutical products, medical equipment, medical examination and aesthetic services. The annual Vietnam Medi-Pharm Expo drew the participation of 150 enterprises from 16 countries and territories worldwide, such as Bangladesh, Germany, Greece, India, Japan, Pakistan, Siberia, Singapore, the Republic of Korea and the US. The medical service packages and the latest treatments from Phuc An Khang International Hospital in Ho Chi Minh City and Paul- Gerhardt Diakonie International hospital (PGDI) in Berlin are new products being introduced to the exhibition. The exhibition, organised after the Trans-Pacific Partnership agreement signing, will create valuable opportunities for domestic pharmaceutical and medical equipment enterprises to bolster cooperation and investment, Deputy Minister of Health Nguyen Thanh Long underscored in his opening remarks. He highlighted that the businesses will have chance to access state-of-the-art technologies and renovate their production lines to produce top-quality products for public medical care and exports. This year’s event is expected to attract 12,000 visitors, who will also be informed about current healthcare policies and regulations and the health sector’s achievements.